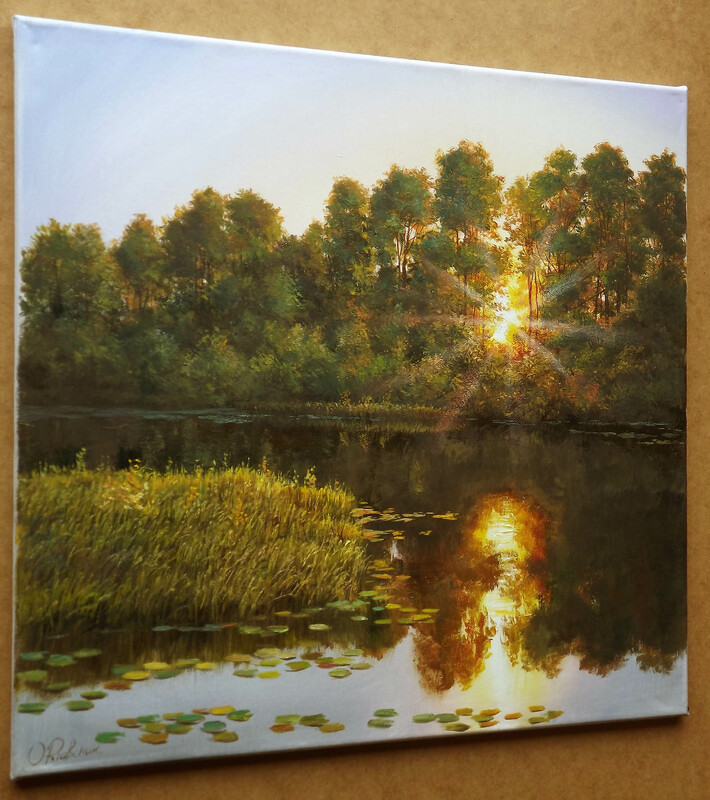 Realistic evening landscape painting with the sunset shining through the forest and reflecting in the river. Painted in oil on stretched canvas. 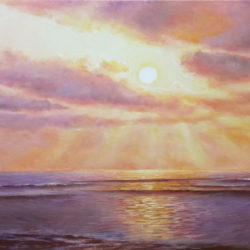 I am more than happy to undertake commissions, please just contact me via Rippingham Art. Every tree, every stone, every leaf and stream has its own song. Own language. Own life. There are so many songs that we do not know. It is impossible to know all songs, but many would like to listen and enjoy this great harmony. I love to travel. Each new country have new song, has own beauty and harmony. And I want to share my feelings about clear water in the stream, young green grass, ray of sun that breaks through the trees, fresh air after the rain... So I'm an artist. My grandfather, my grandmother, my mother, my sister all artists. So I learned to keep the brush when I was a child, then studied at the School of Art, University of the Arts in Moscow, a variety of studios, workshops and etc. 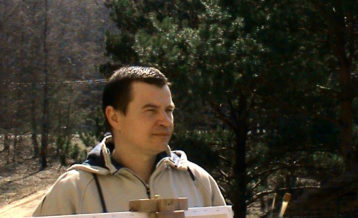 I am a member of the Lithuanian artist's society and Lithuanian creator's association. I had 25 personal and 37 joint exhibitions in different countries. 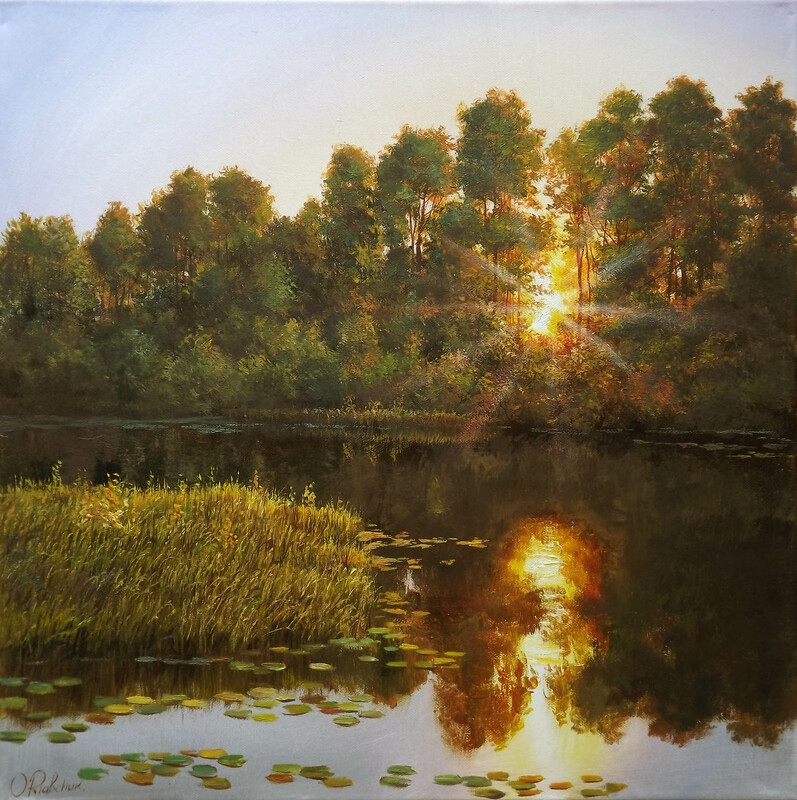 Latest achievement of the exhibitions-competitions in New York "Fine Arts: Global Tide" New York realism gold medal and "Spring in full color" Golden eagle gold medal in the category realism. My paintings purchased by some museums, galleries and collectors from different countries. 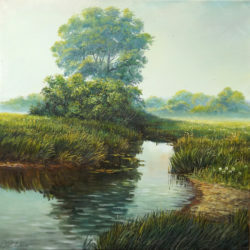 Most of my paintings are realism, but sometimes I have inspiration to make naive, figurative, impressionism, surrealism. Everything depends from mood ... From feedback I got I can say that most people like my realistic paintings because if you look at them you can feel wind, rain you can smell trees, flowers. 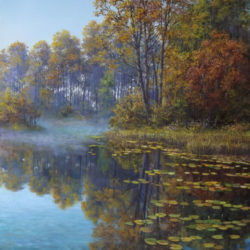 If I paint pond I want to make it so realistic that person who will look at it will wait till he will see fish inside. All my works are original and unique pieces of art made on quality materials and finished to a high standard. For all my paintings I’ll issue a Certificate of Authenticity.